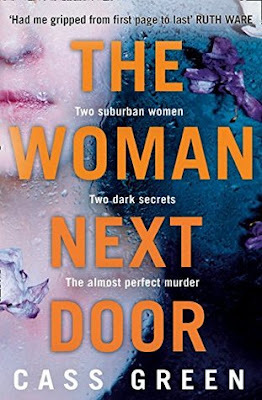 The Woman Next Door is Cass Green's debut adult novel, and I do hope it won't be her only one, as it's an absolute cracker of a novel. Hester is Melissa's next door neighbour. Quiet and reserved, on her own with only her little dog Bertie for company, Hester appears lonely. Melissa on the other hand, is glamorous with a successful husband and teenage daughter. She has the perfect life and the perfect family and Hester is resentful of this. Melissa has been trying to get away from Hester since her daughter Tilly was small. Hester was overbearing, interfering, and more than a little odd even back then. It becomes clear that she has only worsened with time, and is now obsessed with Melissa. When the two women find themselves entangled in an act that will force them to stick together forever, this novel takes on a dark turn, and we truly begin to see Hester in a different light. The Woman Next Door is a novel that will make you question that sweet little old lady living next door to you, in a way that you never thought possible. Gripping from its outset with some thoroughly unlikeable characters, this is sure to be a hit. The Woman Next Door is available from 22 July 2016.